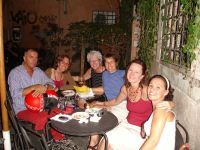 To give our guests a flavor of our capabilities in designing tailored tours in Italy, we would like to share an example of a ten-day itinerary that was specifically designed for a group of ten friends. Arrive in Rome. Airport transfer to your hotel in Rome. Private tour of Vatican Museums and St. Peter's Basilica. You will have a scrumptious Italian dinner at a lively Roman restaurant. Depart for the villa in Tuscany. 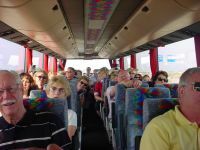 Enjoy the beautiful landscapes as you are transferred to the Italian countryside. You will have lunch at a local trattoria in the quaint medieval town of Orvietto. Upon your arrival at the breathtaking villa, you will have time to relax and get orientated with the beautiful surroundings. Your private chefs will prepare a special Italian welcome dinner. After a leisurely continental breakfast, you will depart for a local tartufo festival in a nearby town. You will enjoy a lunch enriched in the unique tastes of Italian tartufo. Tonight you will have dinner outdoors on the loggia of the villa overlooking the Tuscan hillsides. This morning your local expert will guide you through the majestic village of San Gimignano, known for its famous skyline and medieval towers. You will have a typical Tuscan lunch at a nearby farm house. After lunch your guide will take you to the charming village of Colle Val d'Elsa to explore artisan workshops with hand-made treasures. Back at your villa, dinner will be served by your chefs. This is your day to relax at the villa or choose a specific activity of interest. For dinner, join your personal chefs and partake in the preparation of the evening meal - learning some Italian cuisine secrets. Today you will spend the day in the historic renaissance city of Florence. You will begin with a private and reserved visit to the Galleria Accademia - home of Michelangelo's famous David. You will have lunch at a typical Florentine restaurant. In the afternoon you will be free to savor the magic that only Florence has to offer - shopping, markets, museums, churches, parks. Dinner will await you upon your return to the villa. This is another day for you to relax at the villa or choose a specific activity of interest. Tonight's dinner will be in an ancient Tuscan hill town at an elegant Italian Osteria where the menu will be designed just for you. Today you will have a private tour of a local vineyard and afterward, enjoy a tasting of the wines with Tuscan canapés. Tonight you will have a special dinner prepared by your private chefs to celebrate your last evening in Tuscany. You will depart from the villa and be taken to your hotel in Rome - relishing in one last lunch in the splendid region of Tuscany. Upon arrival in Rome, you will have a private walking tour of the highlights of the "Eternal City". Tonight you will have a splendid meal at a Roman restaurant in the exciting quarter of Trastevere. Depart from Rome. Airport transfer from your hotel to the airport. Arrivederci!! 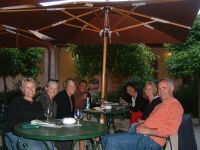 Please contact us about special rates and promotions for coordinating and gathering a group of ten or more guests for a Customized Itinerary!